There’s something about scent that can almost magically transport us to another place. Legendary French perfumer Diptyque makes candles that can help transport you to the streets of Paris or the French countryside. This candle smells of roses and blackcurrant leaves and can make you feel like you are walking by a flower market or enjoying a stroll through a garden. The design of the candle is simple and classic and will elevate the style of any home with a bit of French flair. If the rose and berries scent doesn’t seem right to you, Diptyque has other scents to choose from. The Feu de bois smells of a wood fire while the Feuille de Lavande will transport you to the lavender fields of Provence. Anyone with a deep interest in and passion for all things France inevitably loves French cuisine. To make delicious French food at home, you need a kitchen full of tools. 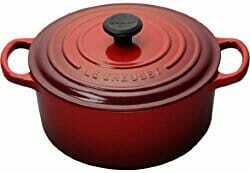 Le Creuset is a French company known for their masterful cookware. This French (Dutch) oven would be at home in any professional chef’s kitchen so the home chef can feel good about using the real deal. The enameled cast iron is rather beautiful and it comes in a range of colors. The fine craftsmanship means that this pan will last for a very long time. Pair this with a classic French cuisine cookbook for an extra delicious gift. Hopefully, you’ll score an invitation to dinner! There are so many classic French dishes and types of food. For coastal France, naturally, it’s all about seafood. Oysters are particularly special to those who live near the sea in France. For the person who has enjoyed a decadent meal of oysters in France or for the person who has only dreamed of it, this oyster set makes a great gift. 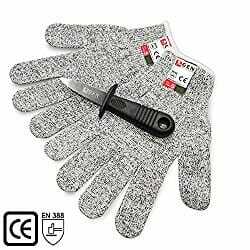 It includes a strong, non-grip knife for opening the oyster and a cool set of cut-resistant gloves to protect you. Oyster shucking can be a tricky business and these gloves can prevent injury. Both the knife and the gloves work for other kitchen activities in addition to being a perfect tool when shucking oysters. If you yourself are a fan of oysters, there’s a good chance this gift will score you an invite for a France-themed meal. French people wearing berets might be a bit of cliche but all cliches tend to start in reality. That is definitely true of this classic French hat. For that person who is all about France and wants to look the part, this beret makes for a great gift. 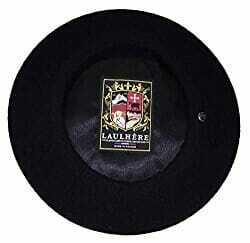 Made by French company Laulhere, this hat is truly l’authentique. It is one-size-fits-most and made of 100% pure Merino Wool with 100% Acetate Lining. The jaunty hat is available in a range of colors and it is unisex. You will struggle to find a truly French beret that is as beautiful as this one. The Francophile in your life will be proud to wear this hat. 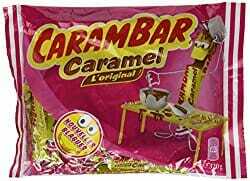 This bag of French caramels offers a bit of sweet decadence, straight from a French fabricant de caramel. But these aren’t just any caramels. Each caramel is individually wrapped and the wrapper includes a joke. So in addition to a bit of sweetness, you get some French humor as well. Of course, the humor will only really be enjoyed by someone who speaks French. You can always use Google translate or a French to English dictionary but there is often something lost in that kind of word for word translation, especially when it comes to humor. The Francophile with at least some grasp of the language will likely be laughing when enjoying this sweet treat. 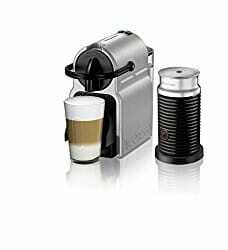 This small and simple machine makes it easy to make a delicious cup of Nespresso at home. It comes with a selection of 16 Nespresso capsules in different flavors and aromas to get them started. With the touch of a button, the machine uses up to 19 bars of pressure to transform a capsule and some water into the perfect beverage. There is also an Aeroccino for frothing milk, either hot or cold. This machine will turn the gift recipient into a home barista who can make drinks like what you might get at a cafe in Paris. You might consider buying an additional box of capsules, especially if you hope to be invited over for coffee on the regular. The Francophile often wants to include their love of all things to France to every part of their home. 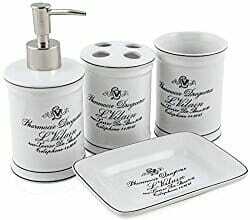 This bathroom accessory set can add some elegance and whimsy to the home bathroom. It includes a dispenser for liquid soap or lotion, a toothbrush holder, a tumbler, and a soap dish. Everything is made from high-quality ceramic and is emblazoned with beautiful French script. The inspiration for this design is French provincial farmhouse. Each piece is optimally sized and won’t take too much counter space. After all, the elegant and classy bathroom shouldn’t be overly cluttered. It’s true that many in France love espresso but there are also plenty of tea drinkers. For the Francophile who is also a tea lover, this lovely tin of a special blend of green tea leaves will hit the spot. 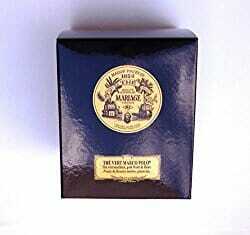 Mariage Frères is known for their masterful tea blends and French connoisseurship. This blend offers smooth and classic green tea with fragrances of fruit and flowers. Although the tea is wonderful in and of itself, the beauty of the packaging and the tin really adds to the overall presentation. 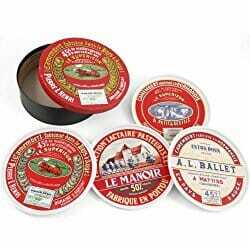 Your France-loving loved one will be happy and proud to display this tin on a countertop. The fleur de lis is a very important symbol that the Francophile is sure to have a special fondness for. Formerly part of the royal arms of France, you’ll see this symbol a lot throughout the country. 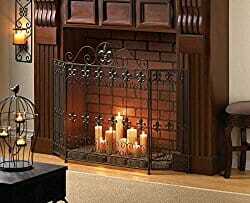 If your France-loving friend has a fireplace, this fireplace screen will add some serious style, elegance, and class. Made of wrought iron, it features a lovely pattern of fleur de lis metal cutouts accented by scrolling designs. It adds a decorative panache without blocking the fire. This looks lovely in any home but the subtle France theme will fit in especially well with an overall French design. To love France almost certainly means to love cheese. Fromage is a vital part of French dining. There’s nothing like a cheese plate when it comes to casual snacking or party dining. To really make the cheese plate extra special, these beautiful plates display four different Camembert cheese designs. The designs are lovely and would look nice on display but they are also perfectly functional and are the perfect vessels for holding delicious cheese. The plates are dishwasher and microwave safe and they are quite durable. The plates come in a very nice gift box as well, making your gift presentation particularly easy. When giving your gift in person, including some nice French cheese and a bottle of French wine will really make this gift a slam dunk. When in France, you’ll encounter many creperies. These restaurants specialize in making the delicacy known as the crepe. Crepes are delicious in both sweet and savory formulations. To make the perfect crepe, you need the right tools. This set includes a crepe spreader and a special crepe spatula. The beautiful tools are made from beechwood, seasoned with food-grade mineral oil. Turning crepes is an art form that just isn’t possible with a typical spatula. These tools really are necessary for making the perfect crepe. The set does come with a recipe booklet and a smoothing pad to keep the tools in fine working condition. If you love crepes, this gift is a win-win because your friend will likely want to show off their crepe-making skills after receiving this set. French cinema is like nothing else and it’s something a true Francophile appreciates or at least wants to. 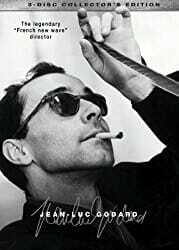 Legendary French director Jean-Luc Godard is a favorite among fans of French cinema and film snobs in general. If the Francophile in your life is already a fan of Godard, this is a great gift. If they aren’t already a huge Godard fan, it’s still a great gift as Godard’s films are a standout example of excellent French cinema. This set includes Passion, Carmen, The Detective, and Oh Woe Is Me. The films are, of course, in French but there are also optional English subtitles. While some Parisians are not fans of the Eiffel Tower, the iconic structure is so much a part of Paris that most Francophiles are helplessly enamored by it. 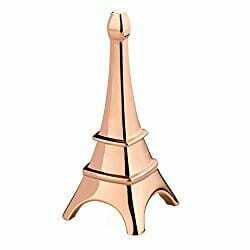 This simple, slightly modern, little Eiffel Tower is designed to hold a ring. It’s a perfect way to safely display your ring in a beautiful way. You have two color options – copper and chrome – and both are just shiny enough to be eye-catching. Although this is designed to hold rings, it could also just be used as a standalone little piece of decor to add to a desk or a bookshelf. For the person who is always thinking about their next trip to Paris or the person who dreams of going for the first time, this little model can keep the dream alive. Another staple of coastal French cuisine is mussels or as the French say, moules. A good mussel pot can make preparing perfect mussels incredibly easy. This enamel pot is made by a noted French manufacturer and it is very attractive. The lid doubles as a holder for empty shells, simplifying cleanup when eating. 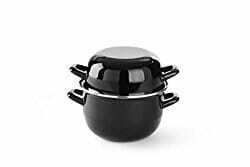 Made with enameled steel and stainless steel for the rim, this pot is very durable. It is dishwasher safe. This isn’t necessarily the best gift for every Francophile but for the foodie who has visited the French coast and still raves about eating mussels there, this gift is perfect. To make this gift even better, think about printing out the Best Moules Marinières (Sailor-Style Mussels) recipe. France’s first professional woman of letters, Christine de Pizan, wrote a gripping tale in the early 1400s that offers fascinating insight into how women were treated in medieval France. The book presents a fictional world where women were powerful warriors and inventors, scholars and prophetesses, artists and saints. Along with annotations by scholars, Pizan’s story is both inspiring and educational. This book is the perfect gift for feminists who are interested in French history. It is not a dull history textbook but it nonetheless teaches readers plenty. 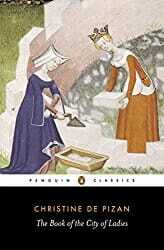 The introduction and notes by Rosalind Brown-Grant are very interesting but de Pizan’s story also sparkles on its own.